Who doesn’t love a wedding – and weddings at Christmas are particularly wonderful. 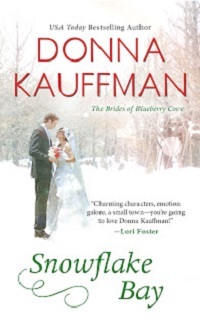 Today I have Snowflake Bay by Donna Kauffman, the second book in The Brides at Blueberry Cove contemporary romance series. 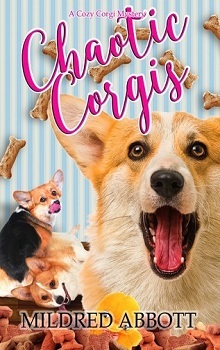 Please read on for my review and excerpt, check out the tour stops to see what other readers thought of the title, and don’t forget to enter the tour-wide giveaway where you could win a Print copy of SNOWFLAKE BAY. The second I have read in this series, Snowflake Bay can be read alone but will be so much richer an experience if you have read the first in the series. Kauffman takes readers to mid-coast Maine, and Blueberry Cove has the classic feel (and frustrations) of a small town. Centering on the McCrae sisters, in this book Fiona has returned to Blueberry Cove to strike out on her own as a designer. It’s not long before she finds herself as the wedding planner for older sister Hannah’s Christmas wedding. It isn’t long before Fi runs into her childhood crush, Ben Campbell, back in town and all grown up. Ben never saw Fiona as more than someone else’s little bratty sister, but seeing her now, successful and apparently in charge of her own life is a revelation. Well, almost in charge as repeated foot-in-mouth goofy moments when he’s around has readers (and everyone else) wondering if she really has grown up. Carefully built and presented, the story allows us a deeper insight into Fiona, the lingering hurt from Ben’s nickname, the family relationships, the friendships and townspeople who all seem to know you, occasionally better than you know yourself, and of course, the new relationship. Kauffman mixes humor, heart, family and a few choice comments to bring a story that will leave you smiling. Feeling somewhat better about herself now, she disentangled herself from the satchel strap, then began mentally rehearsing a summer-weddings-areso- beautiful speech while she looked around for something to scrape the wool scarf out of her mouth. Deciding to get herself unwrapped first, she fished out the end of the scarf, already feeling her fair skin chapping even as she stood there, the warmth of the kitchen creating something of a sting in her thawing cheeks. The struggle with the scarf started almost immediately. It was as if her curls had begun actively weaving themselves into the knitting, becoming one with every loop and knot. So, she was more wrestling with the scarf than unwrapping it, really, swearing somewhat creatively, possibly a wee bit passionately even, by the time a deep male voice that was quite decidedly not her big brother’s baritone spoke from far too close behind her. Fiona froze. Stock-still. And not because of anything having to do with the coastal winter weather or being out of shape. She wasn’t breathing hard. In fact, she might never draw breath again. It had been, what, ten years? Longer. She’d lost track.Or, more truthfully, you’ve blocked it from your memory banks. Blocked it back when the owner of that voice had left Blueberry Cove for college in Boston, excited to get started on fulfilling his dreams—none of which included coming back to his hometown. At the time, blocking her memory files had seemed the only way she’d ever survive not having him in her daily orbit ever again. She felt his big, broad palms cup her shoulders, turning her slowly around to face him, and stupidly squeezed her eyes shut, as if that would change this sudden new reality. All it did was delay the inevitable. Fireplug. All of the air came back into her lungs in one big, sucking gasp. Emphasis on the sucking. Her cheeks burned again, only the sting of remembered humiliation coupled with the memories of her pathetic, unrequited crush on her brother’s best friend, who’d only had eyes for Hannah, far—far—outstripped anything a Maine winter could do to her fair skin. They were both many years older now, she reminded herself, and that meant wiser as well. Although she didn’t feel wiser at the moment. At the moment, she felt instantly thirteen again, pining after a guy who’d barely noticed her, and when he had, had seen her as nothing more than the nuisance kid sister of the girl he was trying to impress. Of course, that girl was now engaged to another man, and for all Fiona knew, her childhood crush was married himself, with a bundle of kids stashed somewhere. Hell, for all he knew, so was she. Which meant, yeah … the distant past was just that. Distant. And past. She prided herself on taking an extra moment to steady herself and let her breath ease out, then slowly back in again, before opening her eyes. Okay, so she was still half-tangled in a woolen neck scarf and she wasn’t exactly making eye contact with him, but it was a start. A mature, grown-up start. Between two, mature, grown-up people. So why is your heart racing like it’s the first time a man has ever touched you? More to the point, why are all your other more mature body parts clamoring for him to touch a whole lot more than your shoulders? You’re both potentially married with kids, remember? Only she wasn’t married. Didn’t have kids. Not even the dimmest of prospects of either on the horizon. A horizon that, at the moment, was completely consumed with a big, tall, rugged reminder of all that she didn’t have. Had never had. A reminder, it should be noted, who still had his hands on her. All her line of vision allowed, however—now that he’d turned her around so her back was to him, tipping her head forward to allow him to work her hair free from the scarf—was the Michelin Man-style, double-padded red snow coat she’d buttoned around her short, curvy frame, under which was a layer of thick hoodie, a long-sleeved turtleneck, and a T-shirt. She surprised herself by letting out a muffled snort. “Well, if the nickname still fits,” she murmured, proud of herself for embracing the humor in the moment, only to discover a split second later she was blinking back stupid tears. Maybe no matter how much a person grew up, no matter how much she matured, she thought, mortified all over again, there would always be a part of her who was still that same, invisible thirteen-year-old girl. Great review! Thanks for hosting!